Abstract: History has many records of crimes against humanity, which were also justified by dominant commercial interests and governments of the day. Despite protests from citizens, social justice for the common good was eroded in favour of private profits. Today, patenting of life forms and the genetic engineering which it stimulates, is being justified on the grounds that it will benefit society, especially the poor, by providing better and more food and medicine. But in fact, by monopolising the ‘raw’ biological materials, the development of other options is deliberately blocked. Farmers therefore, become totally dependent on the corporations for seeds ~ Professor Wangari Mathai. “History has many records of crimes against humanity, which were also justified by dominant commercial interests and governments of the day. Despite protests from citizens, social justice for the common good was eroded in favour of private profits. Today, patenting of life forms and the genetic engineering which it stimulates, is being justified on the grounds that it will benefit society, especially the poor, by providing better and more food and medicine. But in fact, by monopolising the ‘raw’ biological materials, the development of other options is deliberately blocked. Farmers therefore, become totally dependent on the corporations for seeds ~ Professor Wangari Mathai. Árpád Pusztai, Ph.D., a Hungarian born scientist, has spent many years working for the Rowett Research Institute (RRI) in Aberdeen, Scotland, researching the nutritive values of plant lectins and genetically modified (GM) foods. Dr. Pusztai lost his job with RRI for expressing his opinions on the safety of genetically modified foods in a TV interview in 1998. Read more about this honest man. Over his years of extensive research, Pusztai finds that many GM crops have already been approved to be released on the market that may increase the toxicity of allergens in the crop, or contain unpredictable toxins themselves Such carcinogenic and/or mutagenic toxins may be created in GM crops. Many crops have not been properly tested to determine if they are safe for human or animal consumption . Click here to read: Genetically Modified Foods: Are They a Risk to Human/Animal Health? Jeffrey Smith is one of the world’s leading consumer advocate promoting healthier non-GMO choices. 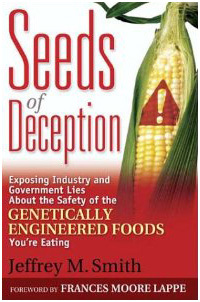 He wrote this book: Seeds of Deception: Exposing Industry and Government Lies About the Safety of the Genetically Engineered Foods You’re Eating. Read this book and you will learn that eating such “experimental food” is to gamble with your health and life. They – the Vested Interests and government agencies said the GMOs are safe for human consumption. Know that this is a big lie based on pseudo-science arguments and bad research. • When a top scientist tried to alert the public about his alarming discoveries, he lost his job and was silenced with threats of a lawsuit. • Scientists were offered bribes or threatened. Evidence was stolen. Data was omitted or distorted. • Government employees who complained were harassed, stripped of responsibilities or fired. • Laboratory rats fed a GM crop developed stomach lesions and 7 out of 40 died within 2 weeks. The crop was approved without further tests. • It is scientifically unjustifiable to presume that GM foods are safe. • There is a need for safety testing, looking for short- and long-term human toxicity, allergenicity and other health effects. • The risks in biotechnology are undeniable, and they stem from the unknowable in science and commerce. It is prudent to recognize and address those risks, not compound them by overly optimistic or fool hardy behavior (Quoting the editors of the UK’s Nature Biotechnology). On this issue, in the US, the attitude is — the Government by the Industry, for the Industry. Those with authority turned a blind eye to the whole issue of human safety placing more emphasis on money making by the Vested Interests. The US government would not require any safety tests or any special labels identifying the foods as genetically engineered. 1. Become familiar with the most common products (and their derivatives) that are most likely to be genetically modified. Products grown and processed in the United States and Canada are suspects. Avoid these whenever you can. o Cotton. The seeds are pressed into cottonseed oil, which is a common ingredient in vegetable oil and margarine. o Dairy – Cows injected with GE hormone rBGH/rBST; possibly fed GM grains and hay. o Aspartame/AminoSweet – Addictive and dangerous artificial sweetener commonly found in chewing gum and “diet” beverages. 3. Purchase beef that is 100% grass-fed. Most cattle in the U.S. are grass-fed, but spend the last portion of their lives in feedlots where they may be given GM corn, the purpose of which is to increase intramuscular fat and marbling. If you’re looking to stay away from GMOs, make sure the cattle were 100% grass-fed or pasture-fed (sometimes referred to as grass-finished or pasture-finished). The same applies to meat from other herbivores such as sheep. There is also the slight possibility that the animals were fed GM alfalfa, although this is less likely if you buy meat locally. With non-ruminants like pigs and poultry that cannot be 100% grass-fed, it’s better to look for meat that is 100% organic..
4. Seek products that are specifically labeled as non-GM or GMO-free. However, it is rare to find products labeled as such. You can also research websites that list companies and foods that do not use genetically modified foods, but be aware that information is often incomplete and conflicting interests may not be declared. 5. Shop locally. More than half of all GM foods are produced in the US, most of it comes from large, industrial farms. By shopping at farmers’ markets, more and more small farms are offering grains and meat directly to customers, in addition to the usual fare (vegetables, fruit, herbs). Shopping locally may also give you the opportunity to speak to the farmer and find out how he or she feels about GMOs and whether or not they use them in their own operation. 6. Buy whole foods. Favor foods that you can cook and prepare yourself, rather than foods that are processed or prepared (e.g. anything that comes in a box or a bag, including fast food). 1. Soy products – half of North America’s soy crop is genetically engineered! Such foods including, soy beverages, tofu, soy oil, soy flour, lecithin. Other products may include breads, pastries, snack foods, baked products, fried products, edible oil products and special purpose foods. 2. Rapeseed in Canada, the crop was renamed “canola” (Canadian oil). Avoid Canola oil! And canola oil may be found in edible oil products, fried foods, and baked products, snack foods. 3. Honey can be produced from GM crops. Some Canadian honey comes from bees collecting nectar from GM canola plants. 4. Cotton. It is also considered a food because the oil can be consumed. Products may include blended vegetable oils, fried foods, baked foods, snack foods, edible oil products, and small goods casings. 5. Rice – Genetically modified to contain high amounts of Vitamin A. Rice containing human genes is to be grown in the US. 6. Sugar cane. A large percentage of sweeteners used in processed food actually comes from corn, not sugar cane or beets. Genetically modified sugar cane is regarded so badly by consumers at the present time that it could not be marketed successfully. 8. Corn and corn products like corn oil, flour, sugar or syrup. May include snack foods, baked goods, fried foods, edible oil products, confectionery, special purpose foods, and soft drinks. 9. Sweet corn. Officials from the US Food and Drug Administration (FDA) have said that thousands of tonnes of genetically engineered sweetcorn have made their way into the human food supply chain, even though the produce has been approved only for use in animal feed. Recently Monsanto, a biotechnology food producer, said that about half of the USA’s sweetcorn acreage has been planted with genetically modified seed this year. 10. Potatoes, and may include snack foods, processed potato products and other processed foods containing potatoes. 11. Flax – More and more food products contain flax oil and seed because of their excellent nutritional properties. No genetically modified flax is currently grown. An herbicide-resistant GM flax was introduced in 2001, but was soon taken off the market because European importers refused to buy it. 12. Papaya – The first virus resistant papayas were commercially grown in Hawaii in 1999. Transgenic papayas now cover about one thousand hectares, or three quarters of the total Hawaiian papaya crop. Monsanto, donated technology to Tamil Nadu Agricultural University, Coimbatore, for developing a papaya resistant to the ringspot virus in India. 13. Squash – (yellow crookneck) – Some zucchini and yellow crookneck squash are also GM but they are not popular with farmers. 14. Red-hearted chicory – (radicchio) – Chicory (Cichorium intybus var. foliosum) is popular in some regions as a salad green., Today there is no genetically modified chicory on the market. 15. Tobacco -The company Vector has a GMO tobacco being sold under the brand of Quest® cigarettes in the U.S.
16. Meat and dairy products usually come from animals that have eaten GM feed. 18. Vegetable Oil – Most generic vegetable oils and margarines used in restaurants and in processed foods in North America are made from soy, corn, canola, or cottonseed. Unless these oils specifically say “Non-GMO” or “Organic,” it is probably genetically modified. 19. Sugarbeets – May include any processed foods containing sugar. 20. Dairy Products – about 22 percent of cows in the U.S. are injected with recombinant (genetically modified) bovine growth hormone (rbGH). 21. Vitamin C (ascorbic acid) is often made from corn, vitamin E is usually made from soy. Vitamins A, B2, B6, and B12 may be derived from GMOs as well as vitamin D and vitamin K may have “carriers” derived from GM corn sources, such as starch, glucose, and maltodextrin. How can the public make informed decisions about genetically modified (GM) foods when there is so little information about its safety? Click here to see a detailed list of what crops, foods and food ingredients have been genetically modified. This is a “must visit” website. Don’t miss it!